How to make a Corporation Partial Income Statement? An easy way to start is to download this Corporation Partial Income Statement template now! For the income statement of loss and profit statement, the single – step statement is commonly used. Well, these formats use one subtraction for net income. The word format is applicable of all versions like Excel and Adobe Reader. The income statement always conveys some critical information, especially company name. According to the periods of given time, the income statements will prepare. The Income Statement covers the following periods of time such as Five Months Ended May 31, Year Ended May 31, Quarter Ended May 31, Five Weeks Ended May 31 or Month Ended May 31. Partial income statement is the essential aspects to get information about the particular accounting period, business persons follows these techniques to get report about specific income statement. The partial income statement helps to find details about the particular portion of respective income statement. Of course it shows revenues and complete details of goods sold within the gross margin. Now we provide this standardized Corporation Partial Income Statement template with text and formatting to help you finish your document faster. If time or quality is of the essence, this ready-made template can help you to save time and to focus on what really matters! This template will perfectly suit your needs! 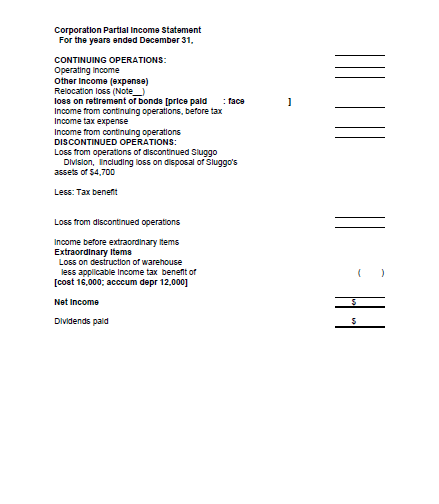 Hope this Corporation Partial Income Statement can help you a lot! Download this income statement now and you can also find more templates about income statements in our website.